The last few nights have been very rough. Each night you start off sleeping in your crib. Then at some point you wake up screaming and end up in our bed. This happens earlier and earlier each night. Since you share your room with NHL, it is hard to get you to settle back in your crib. When you have come to our bed lately you have been very restless. Each night you have tossed and turned . . . and kicked all over the bed. Our queen sized bed is just not big enough for the three of us anymore. All three of us are tired, cranky and need more sleep. We know that something is going on, but are not sure what. Early last night you started screaming in your crib. When Daddy and I walked in you were sitting upright, eyes closed and shaking. We are pretty sure you are having some intense nightmares. Our other option is you are getting sick and we are hoping that is not the case. 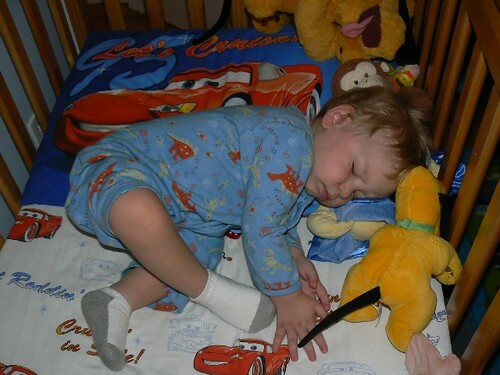 As a reminder I am putting a picture of you sleeping peacefully through the night in your crib here. Just want to make sure you see it can be done and you really do like your room and comfy crib. Aww, poor little guy. Hope he’s not getting sick and starts sleeping better for you. awww poor little man! I sure hope he’s not getting sick.. and I hope he/you guys get a good night sleep tonight! Lindsay @ Bytes of Memory’s last blog post..Some Favorites..